Assessing changes in cancer cell gene expression following treatment with oncology drugs enables better understanding of drug mechanisms of action and the molecular basis of drug sensitivity and resistance. A recent publication in Cancer Research outlines the extensive development and application of a resource for such analyses of gene expression changes: the NCI Transcriptional Pharmacodynamics Workbench (NCI TPW). 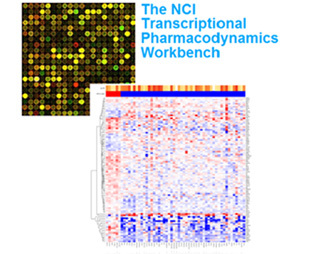 The NCI TPW complements existing platforms such as the Genomics of Drug Sensitivity in Cancer (GDSC), Cancer Cell Line Encyclopedia (CCLE), and the NIH Library of Integrated Network-based Cellular Signatures (LINCS) project by offering a centralized compilation of both drug sensitivity and directly measured longitudinal transcriptional response data for a large, common set of cancer cell lines. The NCI TPW is a valuable resource for the scientific community that could provide information for drug development decisions.